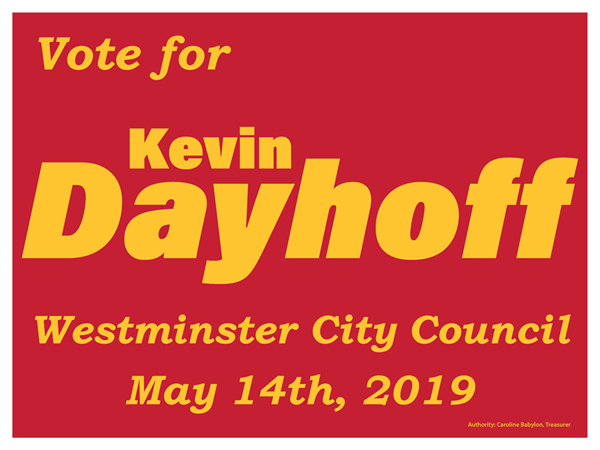 Tuesday afternoon, 2April2019, Caroline, and I went over to the Westminster City offices where I submitted the paperwork to run for one of the three Westminster Common Council seats available in the next municipal election on May 14th, 2019. I am pretty excited about it. I am looking forward to hopefully having another opportunity to serve. Over the years I have stayed pretty active in the community. However, I would like another opportunity to make a positive difference in the community by serving as an elected official. I want to be part of something bigger than me, my art, my farm, my writing. During the election I am on leave from the newspaper. I have very much enjoyed writing for the Baltimore Sun Media Group and I have been assured that after the election I can go back to my old job. Taking 6-weeks off from writing is hard. It’s like telling me not to breathe. At this point in my life, I really want to take another turn in government because I think I can make a difference. 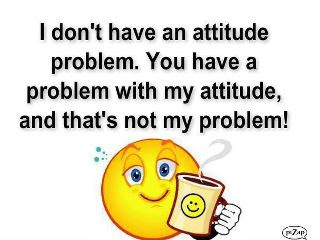 I know the history and traditions of Westminster (and Carroll County) government. Before I was first elected to the Westminster Common Council in May of 1999, I had spent 20-years as an appointed official with various boards, commissions, and committees. Those experiences served me well. I would like to have another opportunity to put those experiences to work. A fresh perspective and new ideas are needed in any organization. As times change, so must the City of Westminster. 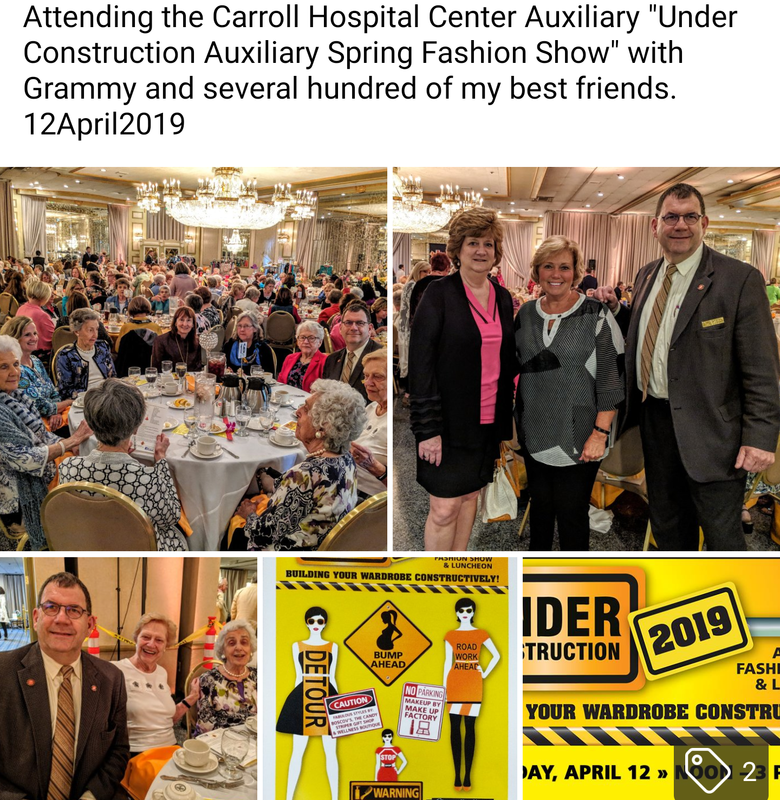 And the changes that are necessary in our community are best served with a relentlessly positive attitude – building upon the successes of the past work of city officials. I applaud their work and accomplishments. However it is time to let someone else have a turn. My vision for Westminster includes getting back to basics and enhancing public works and safety. 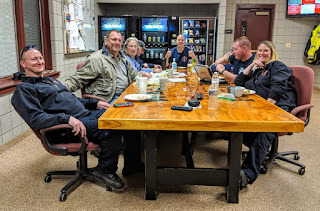 The public works department, the Westminster Police and the Westminster Fire Company play a basic and critical role in our quality of life in Westminster and need our renewed support. I understand public works. I farmed for 25 years from 1974-1999. In those years I worked as a landscape designer contractor and property manager. I have served for many years as a fire and police chaplain and public information officer. The many years of experience has given me a good working knowledge of the operations and the challenges that lie ahead. I look forward to supporting our historic downtown shopping and business district by working to continue to attract special events, businesses, shopping and local jobs. 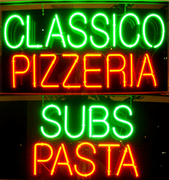 I owned a business for 25 years. I have been self-employed as a writer and an artist since 1973. I have written for several newspapers and magazine since I left office in 2005. I wrote about local government, ‘cops, courts, and crime,’ community events, politics, and history. I look forward to building upon my experiences as a business owner, elected, and appointed official, and work as an historian and writer - to promote the business of Westminster. Support working with other public officials. I was born and raised in Westminster. I have held various appointed and elected positions in local, county, and state government since 1978. I look forward to using that background and experience to Westminster’s advantage and benefit. Over the years I have enjoyed working with many local municipal, county, and state officials. I served on the statewide MML Board of Directors for five years. Increasingly, the future of Westminster and all local government depends on how well we work with other governments, law enforcement agencies, fire and EMS services, education officials, non-governmental organizations, and government officials. I look forward to continue to working my fronds and colleagues. I look forward to continuing to work for the citizens of Westminster. I am excited about the opportunities and the future. 4. Economic Development – which includes a strong approach to annexation, Community Based Employment, and continued downtown revitalization. 5. Enhancing Family Quality of Life – to include expanded recreational opportunities and emphasizing basic municipal services: snow removal, trash collection, water and sewer service and education. 6. Infrastructure improvements – Water, sewer and roads. I am really looking forward to taking another turn as a Westminster elected official. We have been slowly and thoughtfully putting together our campaign. From 1999 to May 2005, Kevin Dayhoff served on the Westminster Common Council and as the Westminster mayor (2001-2005.) Kevin retired from farming, property management, landscape design, and contracting in 1999. He is a second generation member of the Westminster Fire Company. He has been a member since 2001. He has served as a Chaplain for the Westminster Fire Company and Maryland State Police Troopers’ Lodge #20 since January 2011. 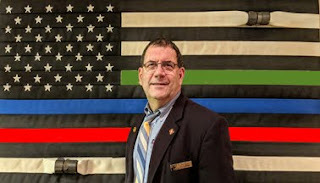 He has served as the Public Information Officer of the Westminster Fire Company since 2007 and assistant secretary since Jan. 2018. 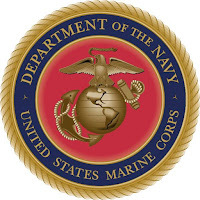 Kevin served in the US Marine Corps Reserves from 1971 – 1973. He has served as a non-partisan appointed official on various state, county and local government boards and commissions since 1978. 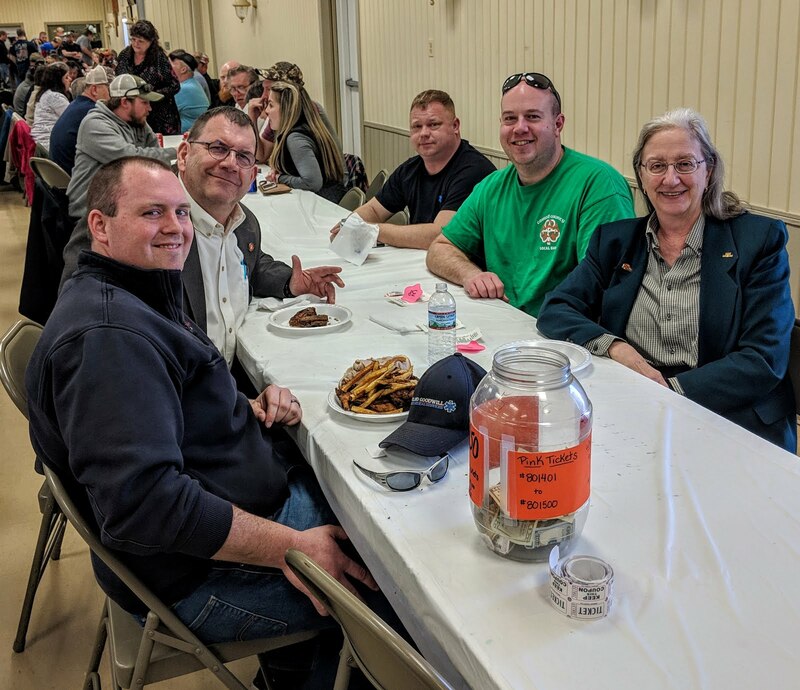 Including his extended family, the Babylon family; members of the family have served as Westminster, Carroll County, and Maryland State elected officials since the 1890s, and in the military since the 1600s. Since 2004 Kevin has written for a number of national and local publications. 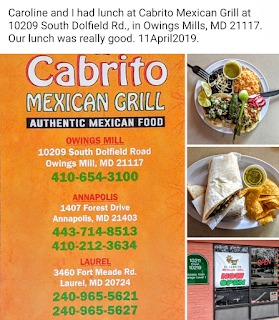 He currently writes for the Baltimore Sun Media Group and is assigned to the Carroll County Times. His current primary assignment is local history, but in the past he has covered ‘cops, courts, and crime,’ politics, and local, state and national government. The Maryland Delaware DC Press Association awarded him an editorial award in 2009, and a religion reporting award on May 12, 2017. Although his ancestors were historically Quakers, he was raised in the United Methodist Church. Since 1998, he has been an active member of Grace Lutheran Church. 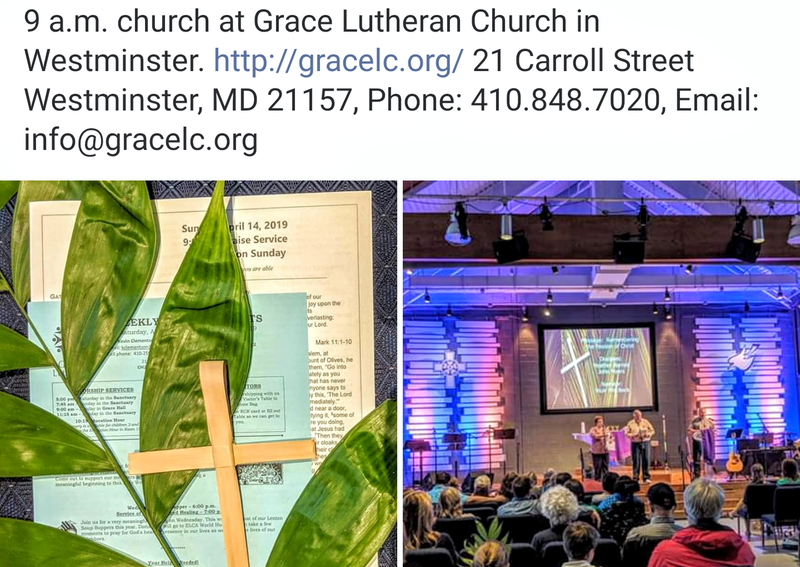 He served on the Grace Lutheran Church council from 2012 - 2018. Kevin served in the Civil Rights movement in the south from 1971 to 1973. He is a member of the Carroll County NAACP Branch #7014 and served on the executive board since November 2012 and secretary since Nov. 2016. 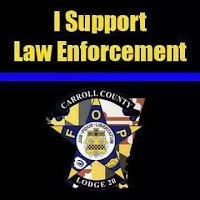 Many members of the local Carroll County NAACP are retired law enforcement officers or defense contractors. He has exhibited art and photography since 1981. 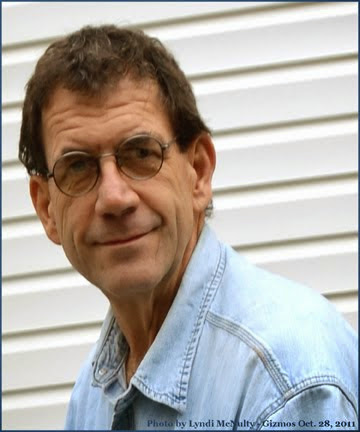 An avid artist and writer, he continues his interest in art, music and books, government and politics, technology, the environment, business and Ag issues. His family, the Wrights, Warfields, Gillis and Haines family have lived in the central-Maryland - Carroll County area since the 1600s. He was born and raised in Westminster and lives in Westminster with his wife Caroline. Bill Rehkopf, the extraordinary PIO for the Sykesville Fire Company in Carroll County – is providing commentary on the Notre-Dame fire on CBSN. I was half-asleep listening and watching the coverage on CBSN and fascinating enough, I heard a familiar and knowledgeable voice accurately explaining various dynamic of the fire. I looked-up at the TV and sure enough, it was Bill Rehkopf. 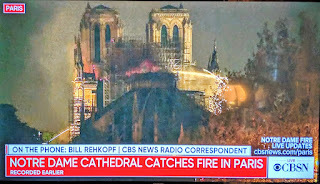 Enter "Bill Rehkopf CBSN Notre-Dame fire" in your favorite search engine… https://www.cbsnews.com/news/notre-dame-cathedral-fire-notre-dame-68-million-renovation-massive-fire-today/. This is so sad – we were just there not too long ago. Notre-Dame is an international and historic witness to history. This is such a tragedy. The Westminster Volunteer Fire Department will be participating in the Maryland State Fireman's Association's statewide recruitment event on Sunday April 14th at the station on John Street in Downtown Westminster. Station and Apparatus tours will be offered and personnel will be available to answer any questions about becoming a member. Stop by between 12-5 PM to start your journey as a volunteer. Main Street in Westminster on Wednesday evening, April 10, was the scene of the 38th annual Westminster rite of spring – the Westminster Road Runners Club Main Street Mile – co-sponsored by the Westminster Recreation and Parks Department. 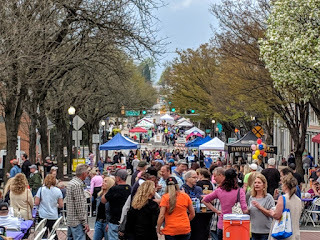 The annual event dates back to 1981 and is known as one of the fastest one-mile courses in the world, because it begins at the top of East Main Street at Fair Avenue and follows Main Street west to the Westminster Branch of the Carroll County Public Library - all downhill, with a total vertical drop of 144 feet. 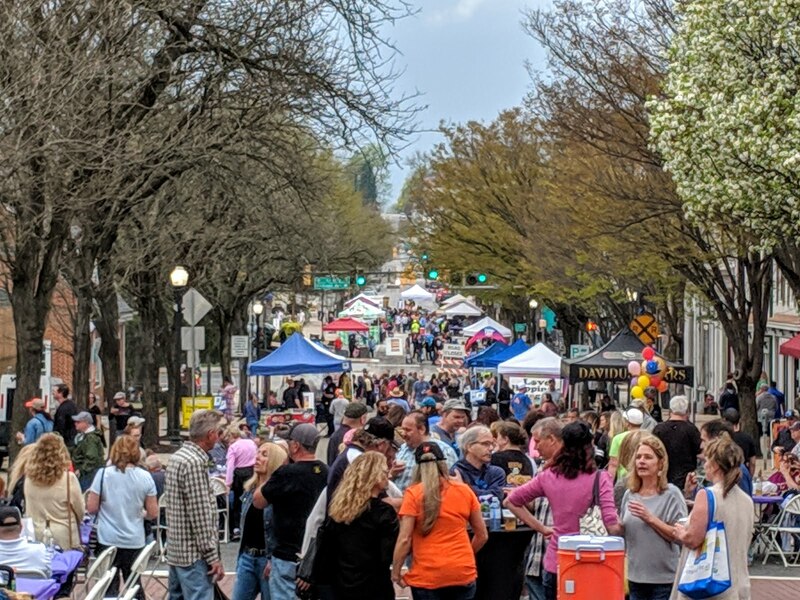 This year the weather was nearly perfect as friends, families, and neighbors gathered on Main Street to take part in the historic event. In keeping with tradition the first heat began at 7 p.m. The race is run in two “heats.” Heat #1 is officially timed and scored with prizes awarded. To qualify for Heat #1, you must be age 11 or older and be capable of running a mile in less than 10 minutes. Heat #2 is the “Connor Smith Memorial Fun Run.” It is neither officially timed nor scored. A clock showing an unofficial race time, however, will be at the finish line. The cheers for the “number 1’s” always seem the heartiest, since finishing is quite an accomplishment for the little runners. Every “number 1” is awarded a medal at the finish line. 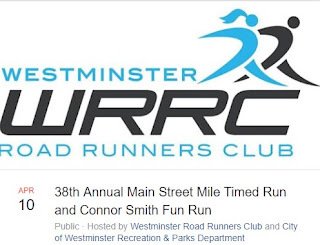 Hats off to the Westminster Road Runners Club - WRRC. The Main Street Mile is a five-star community event that brings together many different folks for an enjoyable family-oriented experience. 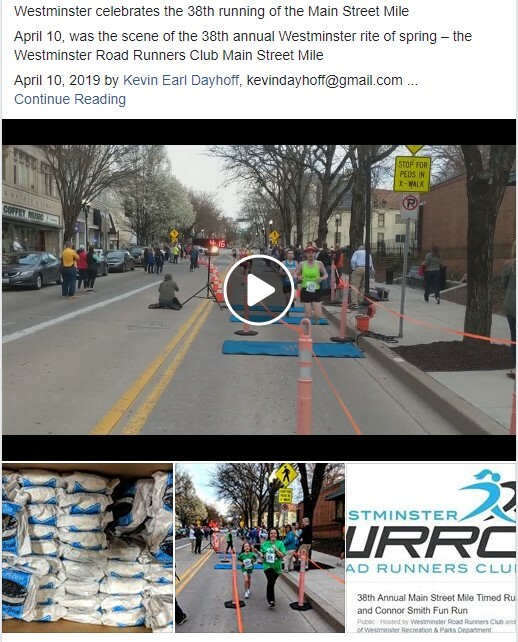 The quality of the WRRC and the greater Westminster community shines through as the race itself has regional “cult” status in the running community and brings many visitors to Carroll County. Organizing the Main Street Mile is a feat all to itself. The race seems simple enough - a one-mile straight shot. But organizing the race is deceivingly complicated as it involves closing Main Street and many intricately moving gears which all need to come together perfectly at a precise time. Fortunately, getting complicated things done for the greater benefit of the community is something that is second nature for Carroll County. Thanks to over 50 volunteers and the help of the Westminster Police Department and Fire Police, this year’s event was another great success. Credit also belongs to the “Race Director.” There have been many great Main Street Mile race directors over the years, including Beth Weisenborn, Liuda Galinaitis, and one of the founders of the event, the late Dave Herlocker. This year’s race director extraordinaire is once again the totally unflappable Sandy Cole Matthias. The very busy Westminster Family Center in the Jerome Day historic armory building on Longwell Avenue graciously opened its doors for pre-race registration and the after-race ice cream and results. Yes, ice cream, the key ingredient of all successful community events. 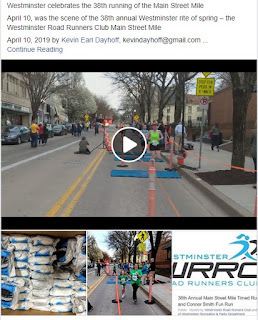 Our correspondent Kevin Dayhoff has covered the Westminster Main Street Mile for over 20-years. Some portions of this article have appeared in previous stories in previous publication. Caroline and I had lunch at Cabrito Mexican Grill at 10209 South Dolfield Rd., in Owings Mills, MD 21117. Our lunch was really good. 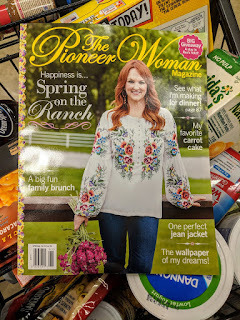 11April2019. Recently while Joe and Jeff were working late one night, they stumbled upon a giant spacecraft lava lamp submerged underwater at the northeast end of town. Of course, this discovery piqued their curiosity. The 900,000-gallon reservoir had not been emptied in years. Jeff was at once concerned about the discovery and consulted a local historian, Kevin. According to Kevin, in ancient Westminster folklore, a Giant Spacecraft Lava Lamp was once the focal point of an ancient Westminsterian religion of which it had always been suggested that it was based on an ancient historical fact. That the ancestors of the Westminster area had arrived by a giant lava lamp spacecraft – and that the spacecraft had been secreted away, somewhere near the City of Westminster. A religion evolved over the worship of the giant lava lamp spacecraft. It has persistently been rumored to still be secretly practiced in and around the hills of Westminster. Could Jeff and Joe have discovered the ancient lava lamp spacecraft? Well first they needed to drain the reservoir in order to investigate. That needed to be done as confidentially as possible so as to not start a media feeding frenzy. In this ancient religion, every residence maintained an altar, centered on a gazing ball, many of which can still be found in the area. This gazing ball altar was used to communicate with the spirit of the Great Lava Lamp Parent who resided in the Temple of the Great Lava Lamp. Pink Flamingos, which are indigenous to the Westminster area, were considered to be the messenger bird of the Great Lava Lamp Parent. Pink Flamingos are now on the endangered species list and, where their nests - inverted tractor tires - are found; by law they cannot be disturbed. It is hoped that further excavations will provide insight into the culture of the Carthaginians who settled Westminster after the Third Punic War. As further details become available we will keep you informed. 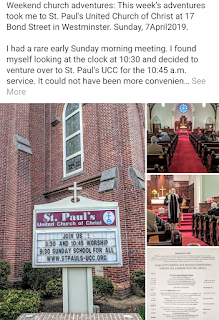 Weekend church adventures: This week's adventures take me to St. Paul's United Church of Christ at 17 Bond Street in Westminster. 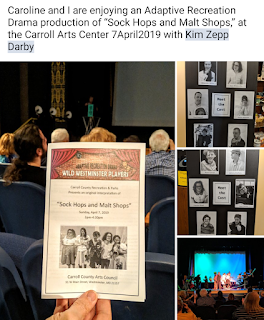 Sunday, 7April2019. I had a rare early Sunday morning meeting. 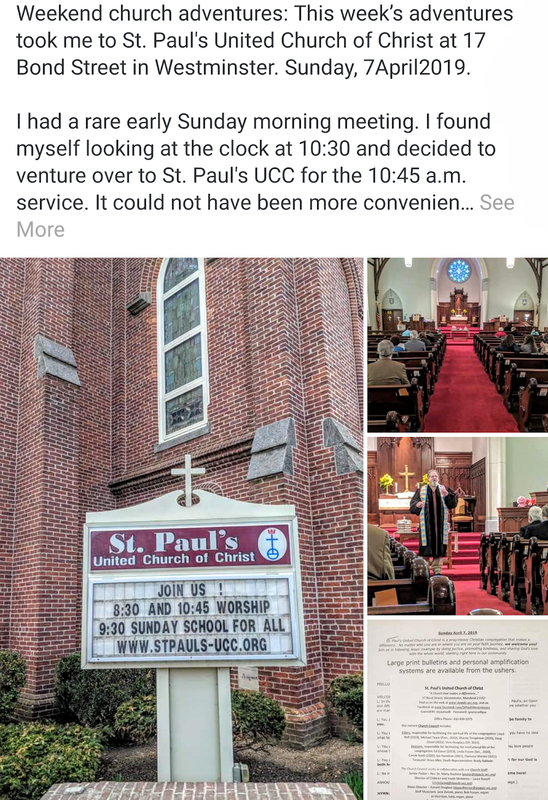 I found myself looking at the clock at 10:30 and decided to venture over to St. Paul's UCC for the 10:45 a.m. service. It could not have been more convenient. 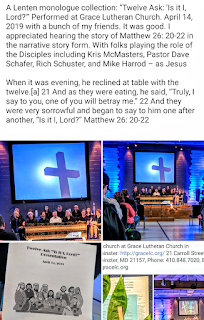 Pastor Marty Kuchma's sermon was on the history and traditions of communion, one of the two sacraments in the United Church of Christ. Adaptive Recreation Drama production of “Sock Hops and Malt Shops"
Caroline and I are enjoying an Adaptive Recreation Drama production of "Sock Hops and Malt Shops," at the Carroll Arts Center 7April2019 with Kim Darby. 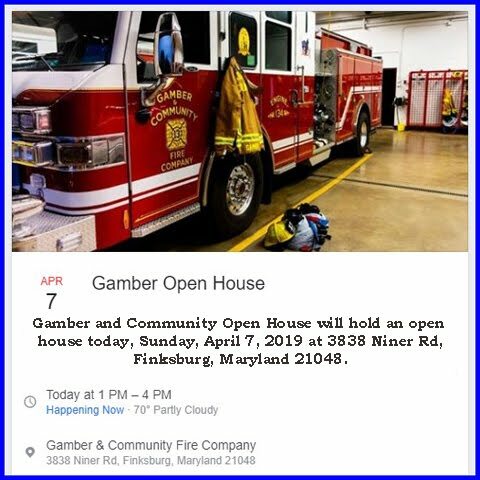 Gamber and Community Open House will hold an open house today, Sunday, April 7, 2019 at 3838 Niner Rd, Finksburg, Maryland 21048. 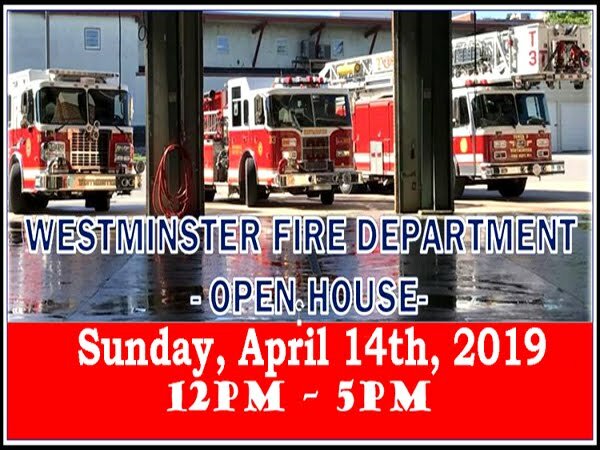 And Westminster will hold an open house on Sunday, April 14, 2019. Today, Sunday, April 7, 2019, at Gamber, there will be live demonstrations and plenty of activities to see and do for the kids and the whole family. Stop by if you are in the area from Noon til 4 pm. on Sunday. "The Westminster Volunteer Fire Department will be participating in the Maryland State Fireman's Association's statewide recruitment event on Sunday April 14th at the station on John Street in Downtown Westminster. 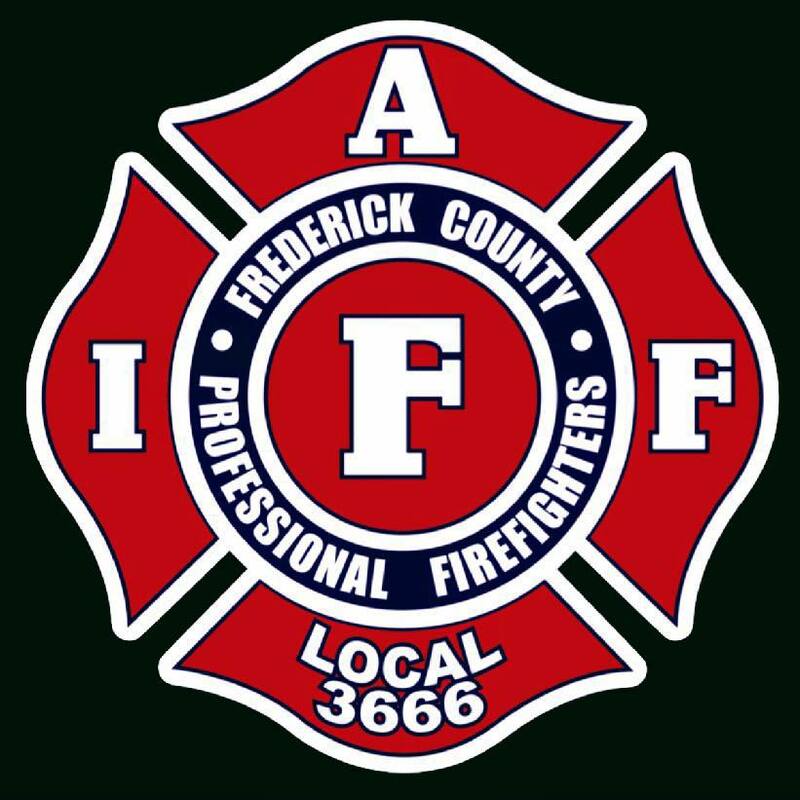 Station and Apparatus tours will be offered and personnel will be available to answer any questions about becoming a member. Stop by between 12-5 PM to start your journey as a volunteer." 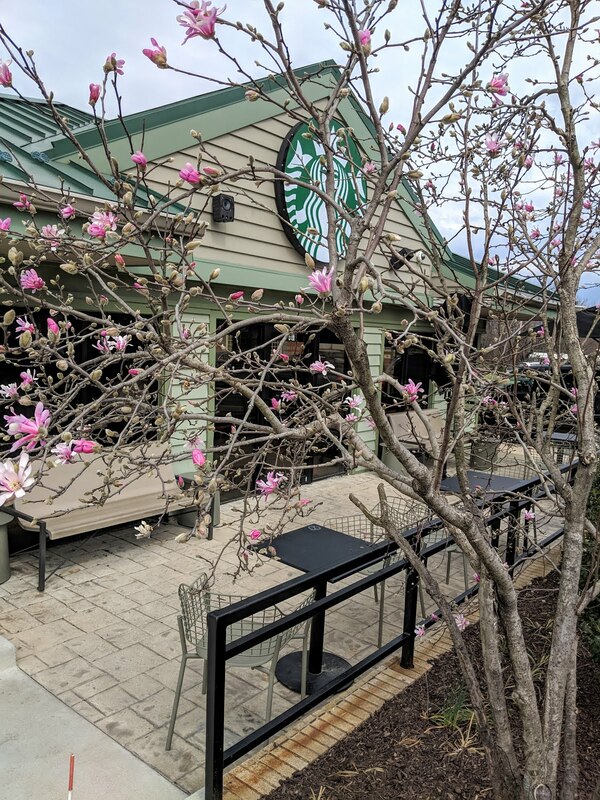 Coffee with a Cop – Sat. 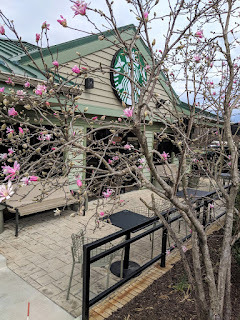 morning, 6April2019. 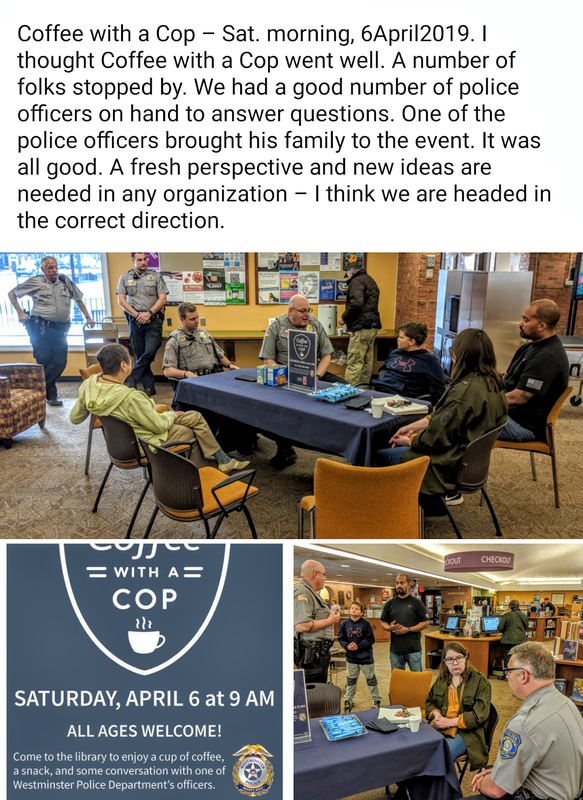 I thought Coffee with a Cop went well. A number of folks stopped by. We had a good number of police officers on hand to answer questions. One of the police officers brought his family to the event. It was all good. A fresh perspective and new ideas are needed in any organization – I think we are headed in the correct direction. 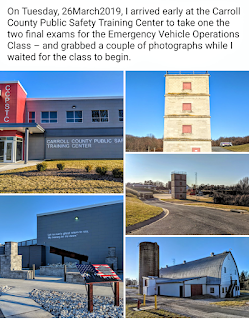 On Tuesday, 26March2019, I arrived early at the Carroll County Public Safety Training Center to take one the two final exams for the Emergency Vehicle Operations Class – and grabbed a couple of photographs while I waited for the class to begin. 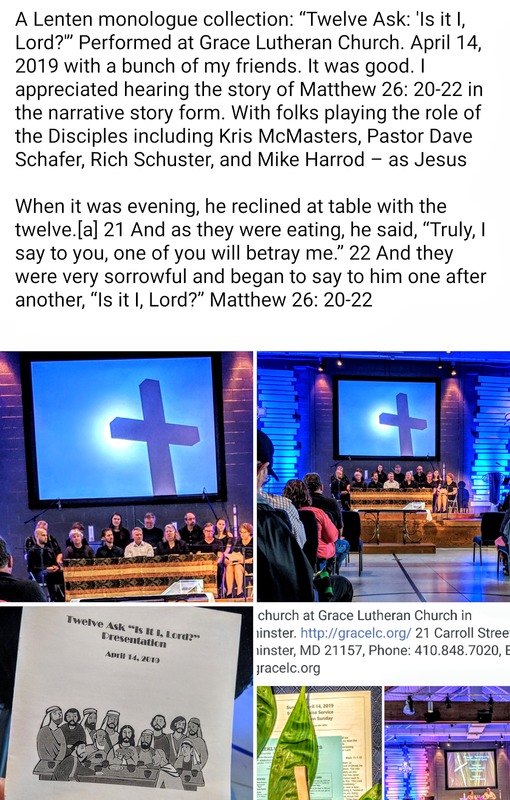 Grace Lutheran Church. 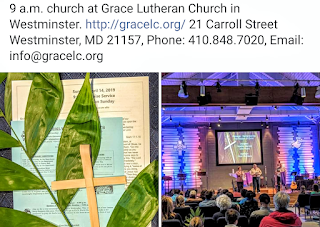 Saturday late afternoon, 30March2019, Caroline, and I had Grace Lutheran Church in Westminster all to ourselves as we took care of some altar guild responsibilities. Just as folks have done since 1867. When we have the church sanctuary all to ourselves, I always want to whisper aloud to the stained glass windows that there is no one around – tell me all your stories. Often I want to just sit on a pew and just absorb it all. 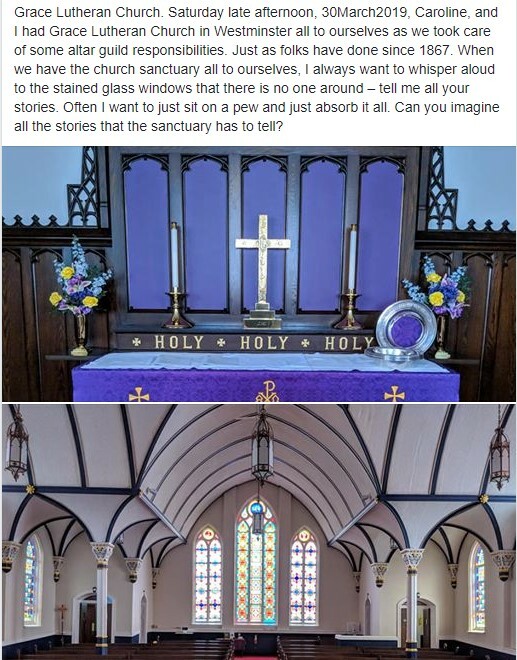 Can you imagine all the stories that the sanctuary has to tell? 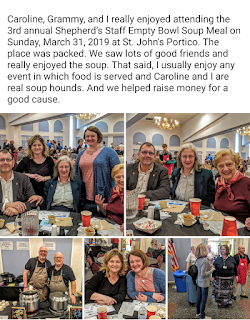 Caroline, Grammy, and I really enjoyed attending the 3rd annual Shepherd's Staff Empty Bowl Soup Meal on Sunday, March 31, 2019 at St. John's Portico. The place was packed. We saw lots of good friends and really enjoyed the soup. 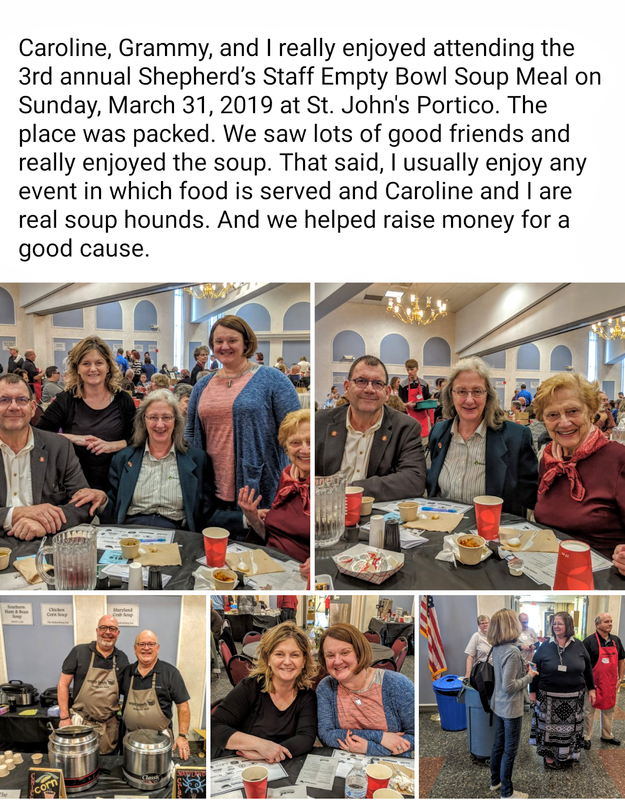 That said, I usually enjoy any event in which food is served and Caroline and I are real soup hounds. And we helped raise money for a good cause. The ticket price included soup, bread, water and a take-home ceramic bowl as a reminder of those whose bowls remain empty. At Empty Bowls we had a delicious sampling of soups provided and served by some of the area's best restaurants – and many of our favorite restaurants including Bud's at Silver Run, Buttersburg Inn, The Food Chick, Forbidden City, Giulianova's, Greenmount Station, Maggie's, Mediterraneo, Mollie's Cafe, O'Lordan's, Oscar's Alehouse, and Rare Opportunity Bakehouse. The Empty Bowls event was created to bring awareness to hunger of all types, foster community, and raise funds to support those in need. Shop from 10 a.m. to 3 p.m. for all sorts of horse-related items. Purchase gifts for others, or for yourself and your horse or pony, at this huge tack sale. 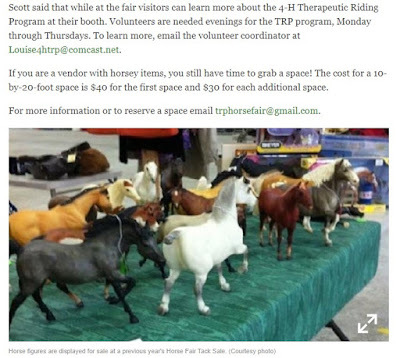 Look for Breyer models, horse books, buckets, treats, grooming tools, new and used tack, equipment, clothes, and supplies. The sale comes just in time for spring riding. There’s no entry fee to shop and you’ll find everything horse inside the double doors of the Shipley Arena. 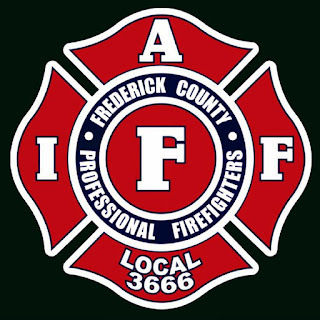 The Career Firefighters Association of Frederick County Maryland was chartered by the International Association of Firefighters in 1995 and currently represents over 400 men and women employed with the Frederick County Division of Fire and Rescue. The members of local 3666 respond to over 50,000 calls annually protecting approx. 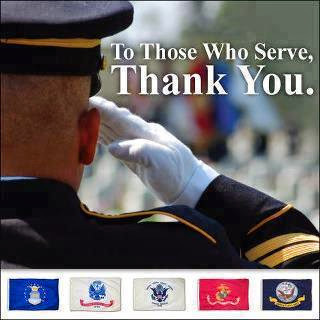 667 square miles and serving more than 250,000 citizens. 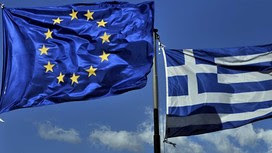 The current collective bargaining law was implemented in 2006. 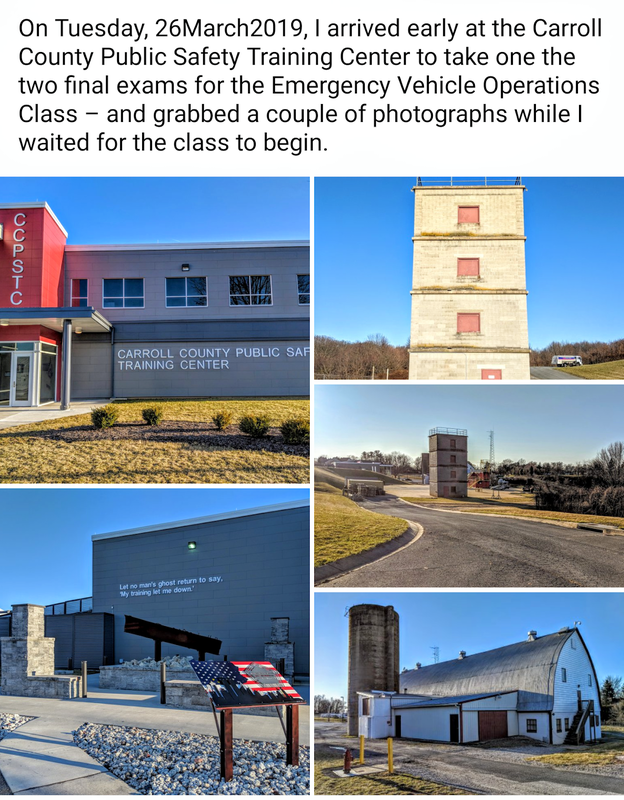 Beginning the month of March, 2004, the Carroll County Board of Commissioners will introduce an additional opportunity for the public to comment on current issues facing Carroll County. In an effort to further enhance their desire to make government more open to the community, the County Commissioners will provide this forum twice a month preceding their scheduled public agenda. The Commissioner Discussion time will begin at 9:30 AM on the 2nd and 4th Tuesday of each month. 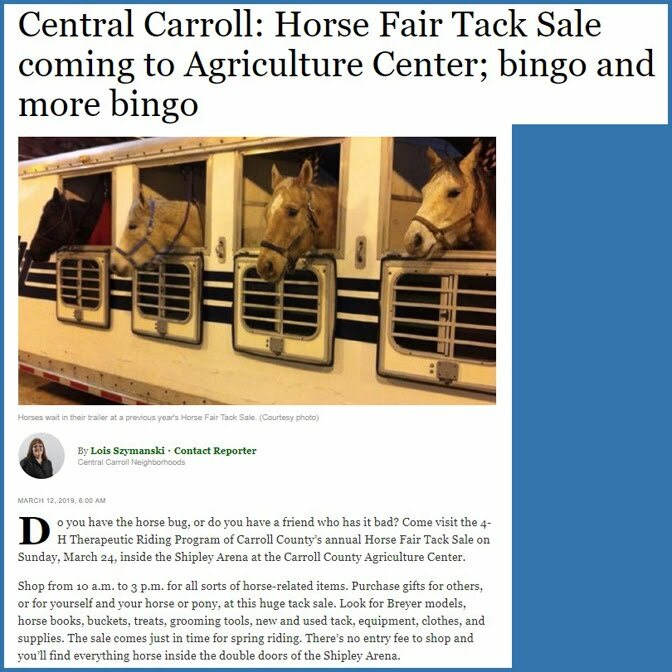 The Board encourages all residents to take advantage of this opportunity for public discussion on concerns and issues facing Carroll County. The meetings will be held for 30 minutes in room 300A of the County Office Building. Citizens will be requested to submit their questions in writing regarding their specific concerns. Any questions that are not addressed during this period will be forwarded to the appropriate County staff, and a response will be forwarded in a timely manner. The first such session will be this coming Tuesday, March 23, 2004, at 9:30 a.m. in Room 300A of the County Office Building. The 30-minute time slot will be re-evaluated for future sessions as participation merits.